How long can a quantum superposition state survive? That length of time is called the coherence time, and depends on where a qubit lives. Quantum states are powerful for computing and exploring physics, but delicate when battling the environment. 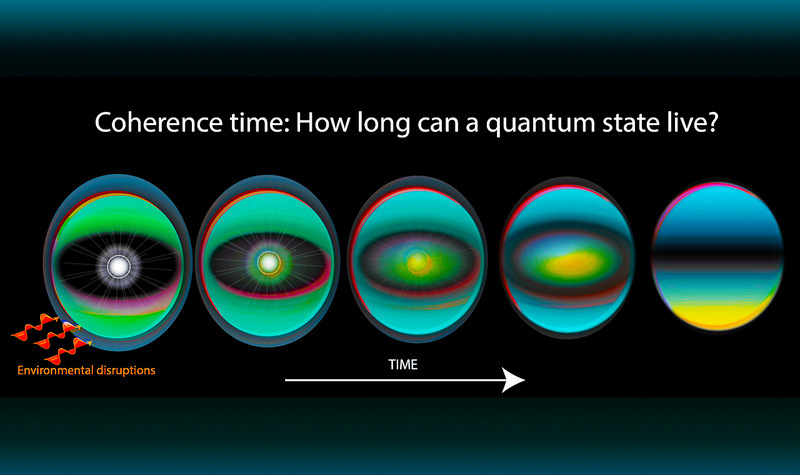 The key is to have a quantum state live longer than it takes to perform an operation or experiment. Physicists design complex containers that completely isolate quantum states from the surroundings, while still allowing for state manipulation. Read more to learn more about quantum coherence record holders. For example, in buckets made from either electric, magnetic, or optical fields, atoms are isolated in ultra-high vacuum chambers. The vacuum pressure is about 100 trillion times lower than atmospheric pressure. To visualize this, imagine light particles like hydrogen or nitrogen in a vacuum chamber. After special pumps remove most of the air, there are so few molecules left that before one molecule will collide with another, it will typically travel a distance comparable to the circumference of the earth. At atmospheric pressure, even though we can’t see them with our eyes, there are so many molecules floating about that they only travel about a hundredth the width of a human hair before they bump into a neighboring particle. In these isolated atomic systems, ion qubits are the record holders for longest coherence time, in some cases boasting times longer than 10 minutes. Here the qubit is formed from an ion's internal energy states. The qubit’s states are mostly insensitive to ambient disturbances such as magnetic fields, giving them the needed protection from the destructive environment. While classical logic bits find their home in room-temperature semiconductors, materials full of interacting atoms and a sea of electrons can spell disaster for quantum bits. One way to remove the environmental disruptions from solid-state systems is to cool the system to near zero temperature. Chilly temperatures sort of freeze out much of the noisy surroundings. Now, as reported in Science Magazine, silicon hosts qubits that can live for 39 minutes at room temperature. This is a record for material systems, and while there are many challenges ahead (enabling qubit interactions, single qubit addressing, for example), such a long coherence time is expected to allow for new research possibilites in this platform.